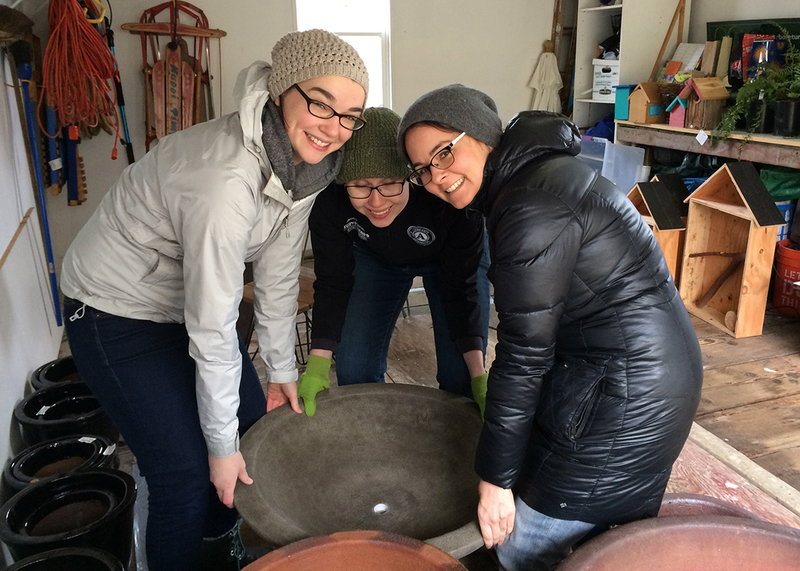 Volunteers Kaitlin Parker, Faye Thornburgh, Rachel Ramsauer at "Mock-Up Party" for the garden. Ballard High School will have one hour, three students, a coach and a 100 square foot plot to create a garden while competing against Nathan Hale during Garden Wars at the Northwest Flower & Garden Show. Another Ballard-based team has had months to plan and design their exhibit garden, but even less square footage. No matter. Ballard will be well represented at the annual event that includes exhibitors from The Netherlands and upstate Maine. Reading over the list of 300+ Exhibitors for the 2017 event, which runs February 22-26 at the Washington State Convention Center, I was struck by how relatively few participants list Seattle as home. So I’m proud that of only ten City Living gardens, two are from Seattle. “Wild by Design: Setting the Table for the Habitat” is designed by Jan Satterthwaite, Vireo Designs and Groundswell NW member, on behalf of Groundswell NW and the National Wildlife Federation. In addition the primary components are locally sourced, from Ballard Re-Use, Fleur de Lys on Leary, and Swanson’s Nursery. As for Ballard High School, the Horticulture Club could win $1000 if they best Nathan Hale in the one-hour Saturday, February 25, 2017 “Garden Wars” challenge. Botany teacher India Carlson announced this first time opportunity and three students volunteered immediately. The BHS team will receive identical landscaping materials as Nathan Hale to build gardens under the watchful eyes of a bandstand audience, emcee and judges. They are allowed zero preparation, other than skills developed in and around their classroom and greenhouse. The National Wildlife Federation recognizes the need to address what Seattle is experiencing; increased density and the loss of wildlife habitat in urban areas. The adage ‘canary in a coal mine’ derived from the practice of using a bird to test whether the air was safe to breathe for a human in a mine or a well. Why do humans think they can survive in areas that cannot support nature, or at what cost? Jan Satterthwaite’s focus as a Landscape Architect is designing therapeutic landscapes. After connecting with Satterhwaite over the shared goal of supporting nature in small spaces the National Wildlife Federation and Groundswell NW formed the NW Seattle Community Habitat Team. Under Satterthwaite’s lead they took on the highly detailed process of designing, submitting, sourcing and mounting a 720 square foot garden for the five-day run of the Northwest Flower & Garden Show. Which makes an hour of Garden Wars look comparatively easy. Unlike the plants and materials that will be revealed to the high school students just before their 1-2 p.m. sprint, the plants from Go Natives, containers from Swanson’s, furniture from James Taylor at Ballard Re-Use, and Pollinator Hotels made by Islandwood Learning Center have been massing at Satterthwaite’s home. Along with bat and butterfly houses the balcony components will make their way to the Convention Center’s Skybridge with the help of many volunteers. Satterthwaite absolutely believes, “Every landscape can be therapeutic.” I look forward to seeing the “Wild by Design” garden, and the Ballard High School students might be thinking along the same lines, because therapeutic sounds very appealing right now.